I love my house. I really do. Only problem is...it is small. As much as I love furniture and decorating with it, there isn't much room with which I can work. However, I am content with what I have and am comfortable with our lifestyle and home. When I think of ever having to leave this house, I cringe. We have so many memories that have been made here! Here was where we came the night on which we were married. Here is where we found out we were expecting our first child...and here is where we brought her home. Yes, THIS is home to me and I really don't mind it at all. Someday, if God decides to bless us with a larger home I do have some dreams of how I want to decorate and furnish it...frugally, of course! One of the things that I would really love to have in my home is a curio cabinet. 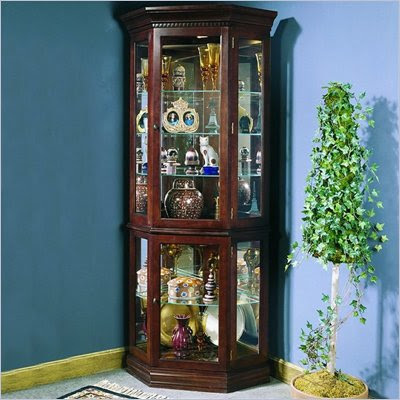 Well, Cymax has yet another store that carries some lovely curio cabinets and that store is morecuriocabinets.com. On this site you can find all sorts of cabinets to fit your needs and decorating tastes. 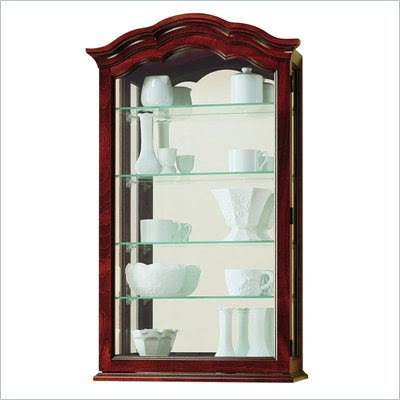 Upon browsing this online store I came across a really gorgeous curio cabinet that I could really picture in my home. It is the one pictured above...isn't it beautiful??? You all know by now that I LOVE dark wood and this simple, yet elegant design is just my style. Now if you are REALLY crunched for space like I am and can afford to get a new piece of furniture, how about a curio cabinet to put in a corner? This would definitely be a great option for us. I am thinking that I would probably put my boxed-up knick-knacks into one. How great would that look?!? If you have small children running around...like I do, and you are worried about them "helping themselves" to your sparkly things then you may want to consider getting a wall display curio cabinet. This would be perfect for me as well. I love how they look so nice on the wall and yet are out of reach of little fingers. The mirror is gorgeous as well and adds a wonderful 3-D effect. 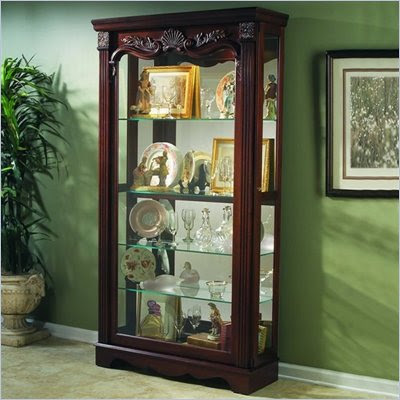 So, when it comes to replacing or just buying a new curio cabinet, you can check out morecuriocabinets.com for your shopping needs. I am sure that they will have something for you and will be sure to provide you with great service and selection. Oh I just love that corner curio cabinet! I would l-o-v-e to have the first curio cabinet. Too bad it is over $1000. However though it is pretty enough to change my beauty jar to say curio $$ instead. These curio cabinets are gorgeous! I want something like this so badly! We got some really pretty things for our wedding and I want to display them but don't have a good place. I love corner shelving so definitely the corner curio cabinet! My SIL has one like that and it looks so nice! These are really nice! We're having the hardest time finding one that will fit where I want to place a curio in our home. I'm going to bookmark the site and check them out when I have more time to browse. Thanks for sharing! We'd have to go with a wall cabinet. My kids have shattered too many pieces of glass (sold our old cabinet because of this) with toys... nice to seethat there's an option for me still though. OK now you have me drooling. I LOVE that first curio cabinet! I have an itty bitty one now and would really love to upgrade.. thanks for the recommendation!